After three years of waiting patiently, our amaryllis crosses are blooming. We tried to use a good mix of species x species bulbs as well as species x commercial hybrids. We’re getting interesting results, so we thought we would post a few of the most recent blooms for you. 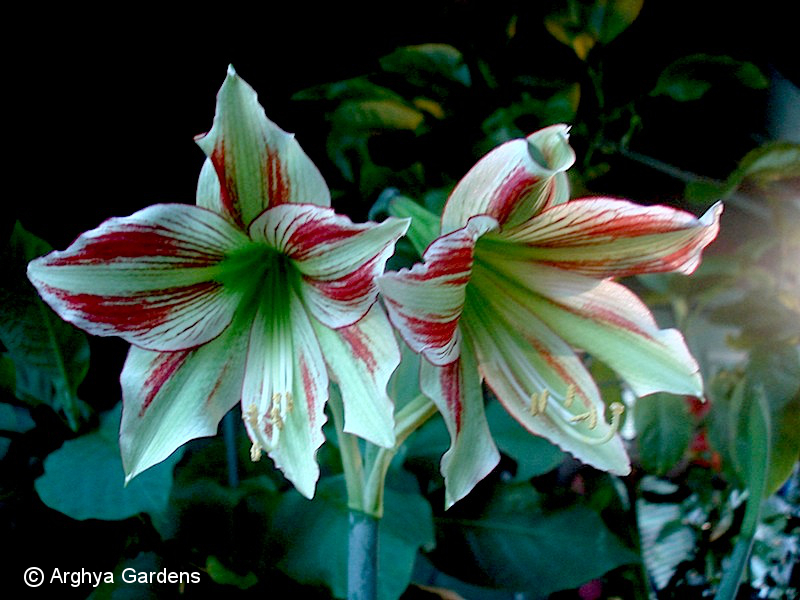 As we’re just coming into bloom season for amaryllis, we should have more to come over the next few months. It will be a while before we have bloom sized bulbs from these hybrids, but we’re trying for seed and may have some available this season or next. This bloom is the result of a H. Germa x H. papilio cross. We are calling this one Arghya Gardens – Samadhi. An H. Germa x H. Lima Cross. This one is Arghya Gardens – Ashoka. H. Charisma x H. Charmeur. Arghya Gardens – D252. H Charisma x H. Charmeur. Arghya Gardens – D255. H Charisma x H. Charmeur. Arghya Gardens D257. Unknown cross. Arghya Gardens – Duta3. H. Charisma x H. Charmeur. Arghya Gardens – E2100.